The vast majority of mortgages in Portugal, and a huge number in Italy and Spain are tied to Euribor, the rate it costs European banks to borrow from each other. 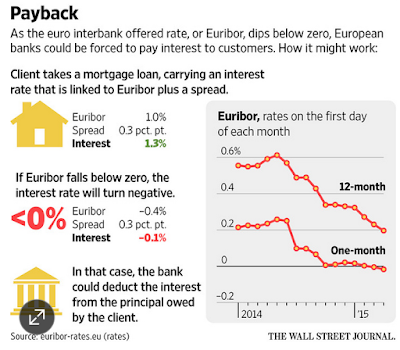 If Euribor drops low, enough banks will have to pay borrowers. It has already happened in Spain. The WAll Street Journal reports Tumbling Interest Rates in Europe Leaves Some Banks Owing Money on Loans to Borrowers. Tumbling interest rates in Europe have put some banks in an inconceivable position: owing money on loans to borrowers. At least one Spanish bank, Bankinter SA, the country’s seventh-largest lender by market value, has been paying some customers interest on mortgages by deducting that amount from the principal the borrower owes. Interest rates have been falling sharply, in some cases into negative territory, since the European Central Bank last year introduced measures meant to spur the economy in the eurozone, including cutting its own deposit rate. The ECB in March also launched a bond-buying program, driving down yields on eurozone debt in hopes of fostering lending. In countries such as Spain, Portugal and Italy, the base interest rate used for many loans, especially mortgages, is the euro interbank offered rate, or Euribor. The rate is based on how much it costs European banks to borrow from each other. Portugal’s central bank recently ruled that banks would have to pay interest on existing loans if Euribor plus any additional spread falls below zero. The central bank, however, said lenders are free to take “precautionary measures” in future contracts. More than 90% of the 2.3 million mortgages outstanding in Portugal have variable rates linked to Euribor. In Spain, a spokesman for the central bank said it is studying the issue. Bankers in Italy said they are awaiting guidance from their local banking association, because loan contracts don’t include any clause on what happens if benchmark rates go below zero. In Spain, Bankinter has been forced to deduct some clients’ mortgage principal payments because an interest-rate benchmark tied to Switzerland’s currency has dipped into negative territory. An executive at another Spanish bank said the lender in recent months has started to put in place an interest-rate floor on thousands of short-term business loans that are tied to short-term variations of Euribor. Two-month Euribor, is at minus 0.004%. 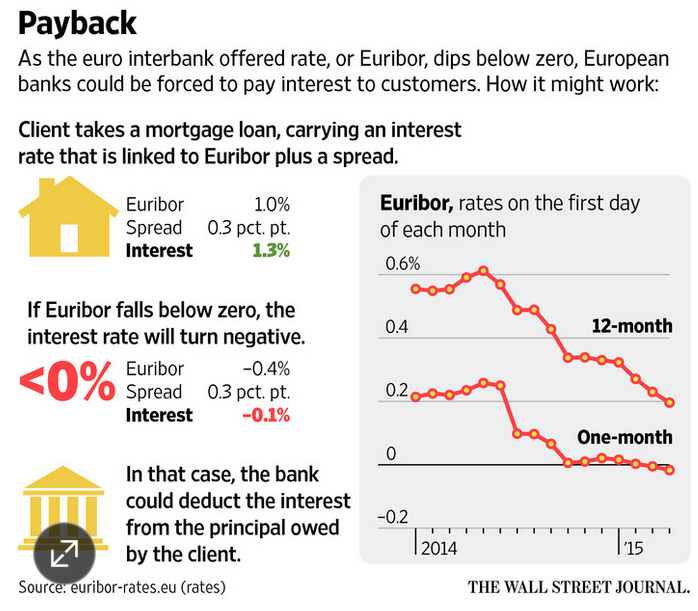 For new loans, the bank is increasing the cushion it charges customers above Euribor. Hundreds of thousands of additional loans would be affected if medium-term Euribor rates enter negative territory, the executive said. The six-month rate is currently at 0.078%. In Portugal, interest rates on most mortgages are linked to a monthly average of three- and six-month Euribor. Both have been steadily sinking and are hovering just above zero. link if video does not play: Princess Bride.